Most widely concept discussed now a day is success. What is success and what is the relationship between success & attitude? Everyone wants to be successful but never try to understand how to achieve that. I have researched a lot to explore this concept and finally prepared a matrix. This matrix was formed and tested on the successful people who became entrepreneur and achieved whatever they desired. You will be surprised to know that success has some parameters but what we apply is different from those and that’s why we face failure. Today our society is concerned about knowledge and believes that books can best be able to attain the same and so go for bookish knowledge. But there are many examples of successful people like Bill Gates, Steve Jobs, and Mark Zuckunberg etc. who have rouse above books and achieved their goal successfully. Also on the basis of my interaction with thousands of people whom I interviewed I have found that knowledge occupies only 5% role in attaining success. After that I found that skill development that is considered need of the hour also occupies 5% role in attaining success. We know discipline plays a vital role right from the school & college levels and it bears only 10% of contribution in attaining success. 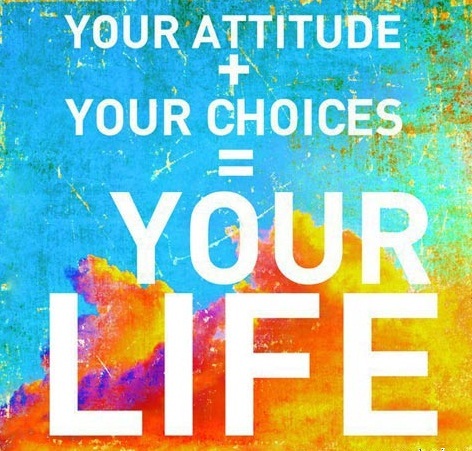 You will be surprised to know that 40% of role in success is played by attitude i.e. the way we perceive things. And the rest of 40% is counted for one’s enthusiasm and ambitiousness. That means it deals with questions like are we really enjoying our profession or just doing a formality. Till now we have been focusing only the first 20% qualities but never thought of positive attitude & enthusiasm. Is attitude really an important aspect? If you have right kind of attitude and you don’t have ample amount of knowledge then you can acquire it and also your disciplined can be developed. How can we acquire positive attitude, even if we lack knowledge, skill and discipline and also how positive attitude can help in attaining the three? What is the basic process? We are lucky that god blessed us with human life otherwise we could have been a crocodile or a tree etc. so therefore we should be thankful to this universe, energy and god which were the reason of our creation. The feeling of thanklessness has increased in us. First of all we should start showing gratitude and conveying thanks to all for everything then universe will return all things that we have ever wanted. Still after exams we are always scared and worried because of numerous questions like whether we will pass or not, if yes how much will we score and how are parents, society etc. will react. How can we overcome such fears? We don’t have to overcome fear, we have to enhance positivity and that can be done with regularly using a single word wholeheartedly i.e. “Thank you “, which is called “Arigato” in Japanese. It is such a beautiful word but we have seen that those who use this word less have generated more negative energy. All things are taken away from us for which our attitude have become negative and have stopped valuing them no matter if it is health, relationships, job, money, career or business, in short everything starts declining. If we become thankful for everything and start saying thank you, will it affect our growth? There is no direct relationship between gratitude and satisfaction. If we feel gratitude and say thank you to somebody it will enhance our energy and we will work more efficiently. By saying thank you never means that we are getting satisfaction. If we actually feel good for our profession, feel thankful to our employer, we will really enjoy our work but if we don’t we will lack positive attitude towards employers, relationships and everything in life. I request all such young people who have adopted negativity in life and relationship, taken lots of stress during exams, just for one time try to adopt positivity in life and the tips of success in which we have stated that you have to adopt one word and not like the way we crammed our nursery rhymes like “Jack & Jill went up the hill” without understanding its real meaning. The need is to feel it, if we will feel gratitude from heart then only it is useful and ultimately will generate the desired result. As enthusiasm and positive attitude covers 40% each, how can we apply them in life? Always make eye contact with the person to whom you are saying thank you, so that your honesty & genuineness will be communicated to that person. Have to say “Thank you” three times for each favor. Give reason for saying “Thank you”. For example I thank my pen as it helped me to do my work in the office. My mother helped me to achieve what I desired for, so I’m thankful to her also. Also one should say thank you before and after taking a favor. 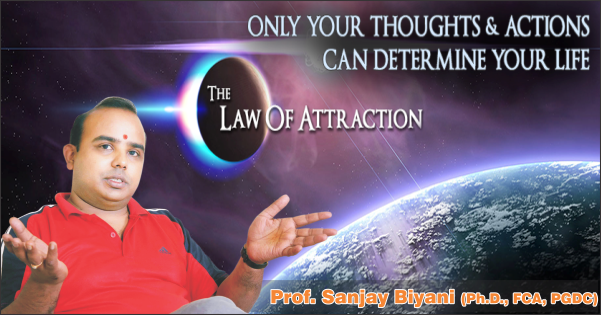 Therefore, when one apply all these rules one will become beautiful, satisfied and will definitely attain success. What is actually psychological counseling? As now a day’s students have appeared for their board examinations and beard a lot of exam fear, stress and tension. They are captivated by a common thought that what I want to become as there are so many counselors around them in the form of parents, relatives, neighbours, peers and many more. Also out of the 700 crore population we need to understand that every individual bears a unique personality and obviously they all have different potentials and interest. Therefore, psychological Counseling aims to assist people control their difficulties and transform personal troubles into their own personal growth. In India the small towns are totally neglected in this context whereas in metro cities this concept of psychological counseling has captured interest. 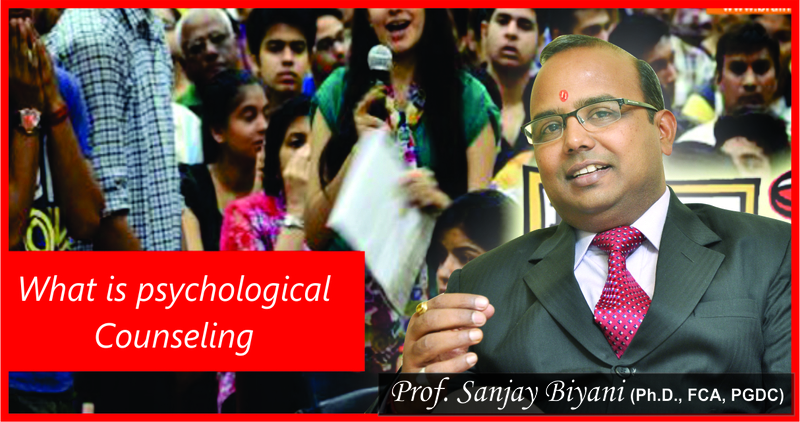 Is psychological counseling meant for some students or group of students? If no then is it appropriate for each child? Actually psychological counseling is the process to know or realize whatever is running inside, at our unconscious state of mind, our interests, passions and desires which ultimately gives us happiness and satisfaction. For example, if someone asks me how the moon looks like, I will tell something about it, you will understand something else and the third person listening to the meaning will interpret in some other way. Although all the three will be correct in their own ways and so their interpretations will depict automatically the type of personality each one possess. Similarly we show students’ different pictures and they all interpret them in their own ways. With the help of such exercises we get to know about their personalities and their interest areas. And hence accordingly can categorize them. For choosing a vocational course how much it is important to consider or consult a psychological counselor i.e. when a child should approach for Psychological counseling? The child should approach after 10th standard because at that time the child is mature enough to take decisions but if not possible for any reason should approach during 12th standard. You have been dealing with many students from long time that face problems during career selection because of parents, neighbors, relatives and peer pressure. Generally what kind of general troubles students face? General problems that I have observed specifically in girls are the fear element and that too in excess. There exists a phobia pertaining to exams and to the society which develops an inferiority complex. The students which are fearless can perform better and are more successful. Those who have fear their life is full of troubles. The main reason of fear is lack of faith. In classrooms students doubt their teachers, they doubt god and hence their power to believe is very poor. In youngsters the reason for their declined efficiency is lack of faith. For becoming fearless the main key is to increase the faith. Therefore, the more is ones faith, the more one can become fearless. If you want to see how big or successful a person is one should see how much faith that person bears. Higher the faith higher will be the personality & vice versa. Why there is a lot of fear among students despite of all requisite facilities provided like best courses, colleges or universities? No matter what religion on belongs to but our youngsters lacks faith, they don’t trust god. It has been proved through Newton’s Law whatever you give you will receive the same. The moment the youngsters will start trusting they will gain confidence. It’s simple if you start trusting you will gain faith for yourself. For the students hailing from small towns and villages how can they be benefitted through psychological counseling? We are very concerned for youths and their career related problems. In Biyani Group of colleges, Jaipur we have established a counseling cell in which a student categorized on the basis of their performance tests and accordingly we help and guide students. The law of attraction says that like attracts like, so if we take something for granted, we will be taken from as a result. Remember, “whoever does not have gratitude, even what he or she has will be taken from him or her”.To your current circumstances, you have to practice gratitude and make it your new way of life.To live in gratitude, to experience the magic in your life, thank you must become thetwo words you deliberately say and feel more than any other words. They need to become your identity. Thank you is the bridge from where you are now, to the life of your dreams.The more you deliberately think and say the magic words, thank you, the more gratitude you feel.The more gratitude you deliberately think and feel, the more abundance you receive.According to the law of attraction you have to be grateful for what you have to attract success to you. So, without gratitude, it’s impossible to have permanent success. Gratitude is something you must have before you can receive, not something that you simply do after something goods has happened. Most people are grateful after they receive something good, but to make all your wishes come true and change your entire life by filling it with riches in every area, you must be grateful before and after.